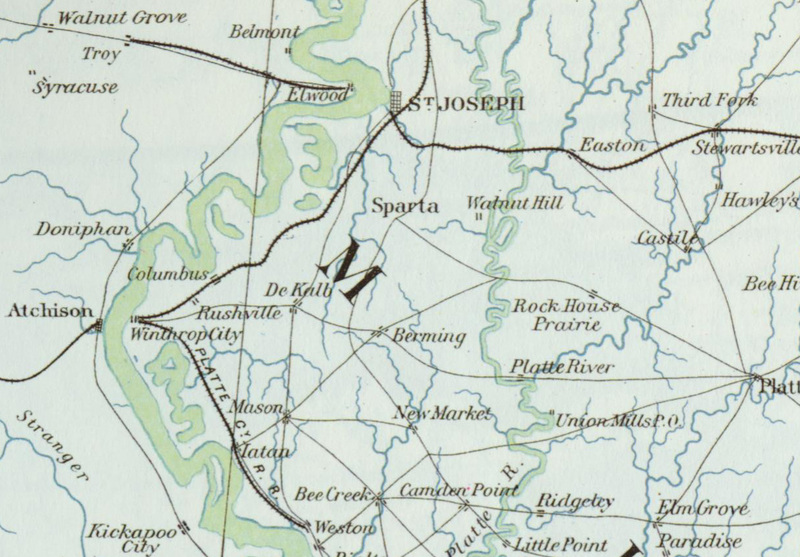 The stories about John L. James suggest that he had relatives in the St. Joseph, Missouri area prior to his removal there in about the winter of 1863-64. While that could have been William A. James, Cynthia, or the daughters listed with Cynthia in the 1860 census, at least one report indicated that John L. James had brothers in that area, possibly William M. James. A William James is mentioned in the History of Buchanan County, Missouri (1881), at p. 991. He was a farmer and stock raiser in section 7, post office St. Joseph, having been born 24 December 1813 in North Carolina, "about thirty miles north of Wilmington." He was reared and educated there and emigrated west in the spring of 1846 with a family of 13. They took a steamer at Louisville, Kentucky and arrived in Buchanan County in May. He married Mary J. Register in December 1843 and they had 11 children, six of whom were living in 1881: Rebecca E. (Mrs. John C. Crow); William D. (ae 24 1870); Sarah J. (Mrs. John Brown); Alfred F. (ae 13, 1870); Cordelia E. (ae 7, 1870) and Harry E (ae 3, 1870). They belonged to the Presbyterian church. Burials from this family are in Pleasant Hill Cemetery, two miles south of St. Joseph. Mary J. " 35 "
Rebecca E. " 16 "
Margaret E. " 7 "
John A. " 5 "
Robert [T] " 3/12 "
Martin " 8 " "
Mary J. " 6 Mo "
Polly " 35 " "
Martin V. " 14 "
Stephen V. " 7 "
Merrill " 15 " "
David " 15 " "
Ryland " 17 " "
A will of James James, dated 5 March 1856 and recorded 31 March 1856, mentions his wife Caroline, brothers David James and Calvin James, and sisters Ann Toffenmeuer, Polly Vessar, Barbary James, Susan Shalaver and Lucinda Sreves.67 There was a Barbara James, age 50 and b. in Tennessee, in Fremont township in 1860 (P.O. Easton), living in the household of Joel Murphy and his wife Caroline (age 22, b. Mo). Susan C. 16 " "
Francis M. 15 " "
History of Buchanan County, Missouri (1881), at p. 59, indicates that Logan James settled in Washington township in 1837. G H " 7 m "
Rev. T. Buren 24 ME Circuit "
65. Elizabeth Prather Ellsberry, Buchanan County, Mo. Marriage Records 1839-1855, pp. 2 & 19 (Chillicothe, Mo. : 1961). 66. Nadine Hodges & Mrs. Howard W. Woodruff, Buchanan County, Mo. Abstracts of Wills and Administrations, from books A & B, 1839-1851, p. 23 (1969). 67. Nadine Hodges & Mrs. Howard W. Woodruff, Buchanan County, Mo. Abstracts of Wills and Administrations, from books A & B, 1839-1851, p. 23 (1969).